← What Happened in East Timor? Another One Down: Fall 2017 Semester in Review! We have completed another eventful semester here at STAND, and we are excited to share our successes with you! From lobbying on the Hill for atrocities prevention legislation, rallying for refugees, and fundraising for the Rohingya of Burma, we made hundreds of phone calls, published several op-eds, and shook social media. This is STAND’s Fall 2017 Semester in Review. In October, we launched #PledgeGAPAGAPA to advocate for the Elie Wiesel Genocide and Prevention Act. This year, we asked upSTANDers to “Go Greek” for genocide prevention (#genprev!) by collecting signatures, taking photos, and writing letters and op-eds. Thanks to the work of hardworking STAND students and our advocacy partners, the House bill (H.R. 3030) now boasts 60 co-sponsors, and the Senate bill (S. 1158) boasts 29. We’re looking forward to continuing to advocate for this groundbreaking piece of legislation, and hope you’ll get involved – check out our #PledgeGAPAGAPA toolkit here! Many STAND chapters hosted #YemenAid Stands to raise awareness and engage students in advocacy for Yemen. Our “YemenAid Stands” functioned as good old fashioned lemonade stands, but with a twist! 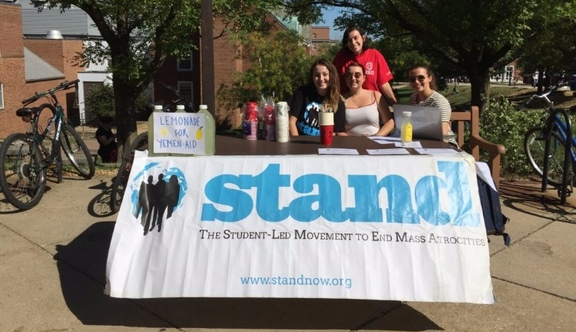 In exchange for some refreshing lemonade, students had two options: either call their representatives and urge them to oppose U.S. military support for the Saudi-led coalition in Yemen or donate to STAND to support our advocacy efforts. U.S. government officials and legislators have taken increased note of the human rights violations in Yemen, and in November, President Trump condemned Saudi Arabia’s blockade on Yemen’s ports. 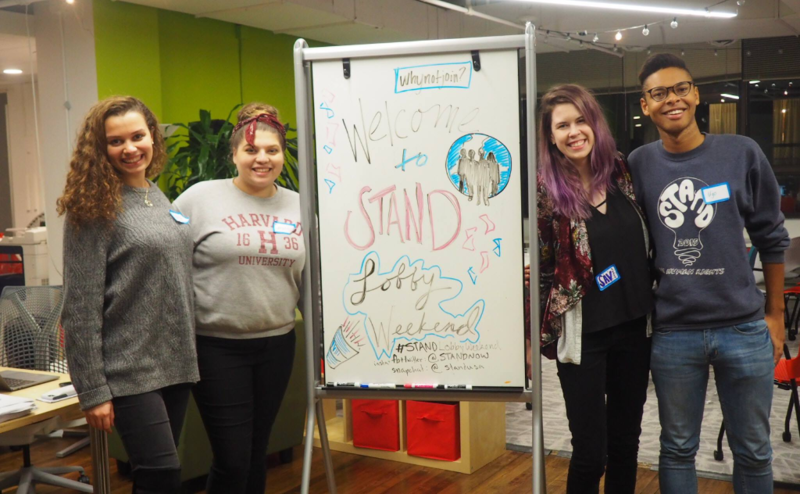 STAND students have contributed to building a critical mass of leaders invested in halting US arms sales used against civilians in the conflict. 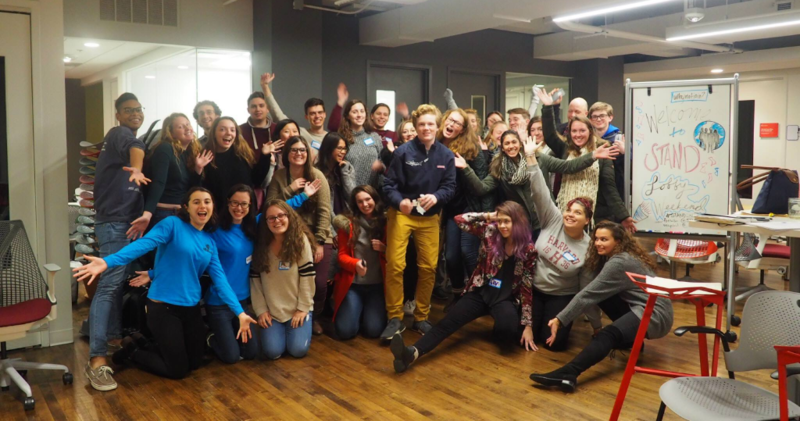 Students from across the country traveled to Washington D.C. for a weekend jam-packed with education sessions, campaign and advocacy training, and lobbying. All in all, 50 passionate students made it to Capitol Hill to lobby over 20 offices for the Elie Wiesel Genocide and Atrocities Prevention Act, action to protect the Rohingya Muslim minority in Burma, and an end to unconditional U.S. military support for the Saudi Arabia-led coalition responsible for vast civilian harm in Yemen. We continued our partnership with the Nexus Fund to support peacebuilding in Burma, where the Rohingya Muslim minority group have been driven from their homes en masse and may be experiencing genocide at the hands of the Burmese military. With your support, we have raised over $7000 to support the Rohingya. We are inspired by all of the creative fundraising over the holiday season, through Giving Tuesday, art sales, and fun, engaging dares! Your support in this campaign is something to celebrate and we hope you will continue to support this work by donating at www.standnow.org/donate. STAND advocated for key atrocities prevention legislation in more than ten states. Our new group of State Advocacy Leads conducted outreach in several states to broaden STAND’s network of individuals, successfully published several op-eds and blog posts, and held multiple call-in days on a range of issues including the Elie Wiesel Genocide and Atrocities Prevention Act, U.S. involvement in the conflict in Yemen, and attacks on U.S. refugee resettlement, including the Muslim Ban. In addition, our Education and Communications Task Forces covered a range of conflict areas in their pieces including less highlighted areas of injustice such as Guatemala, Punjab, and Indonesia. Thank you to each and every one our partners, chapters, and supporters for helping STAND with another successful semester. Your efforts, whether making a phone call, signing our #PledgeGAPAGAPA petition, fundraising for #RiseForRohingya, or hosting a YemenAid Stand, have contributed greatly to these successes. Our campaigns and advocacy efforts are only successful because of all of you and we can’t wait to continue to build with you in 2018!